After more than 300 years some of Rembrandt's paintings still have surprises for us. One of these, the famous "Danae," has been on view at the Saint-Petersburg Hermitage Museum for over a century. It shows a young woman, Danae, lying on a couch bathed in sunlight, one of her arms stretched towards the sun. In the shadow above her head hovers a traditional cupid and on the left an old serving woman is looking out from behind a curtain. Much has been written about this painting, and yet a number of elementary questions remained unanswered for a long time. When exactly was "Danae" painted? Who was the model? How does one explain the difference in style and colouring in certain places? The answers have finally been provided in the mid-twentieth century by X-rays and optical microscopy. The examination was carried out by L. Siverskov, head of the Physical X-ray Laboratory at the Hermitage in 1956-1962. 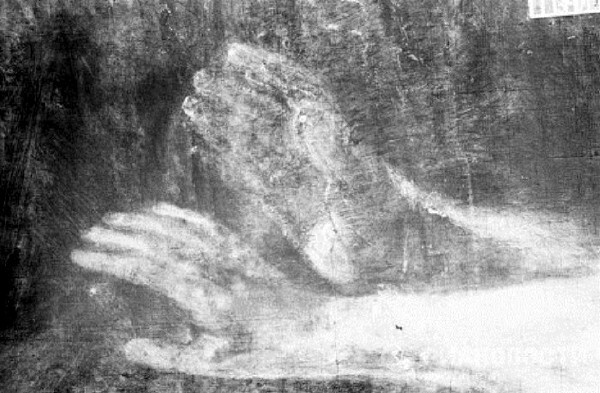 It was found that Rembrandt had two shots at the "Danae". The first time was in 1636. Beneath the present head of Danae X-rays reveal an earlier one modelled on Rembrandt's first wife Saskia. X-raying also showed that the servant's head was originally in a different position, much further to the left and depicted in strict profile. About ten years later Rembrandt returned to the painting. This time the head of Danae was modelled after his second wife Hedrickje. Now art historians have established fairly conclusively that the painting was completed in 1645. It is noteworthy that the style of the first version is somewhat cold and academic, while the overpainting has the warm golden tones so characteristic of the later Rembrandt.